The tragedy inside modern horror is an element sometimes not well-played for me, either overdone or undercooked. Janus Descending, a space horror set on a distant planet with evidence of rich soil and a dead civilization, plays its tragic hand well: listeners know this will not end happily from the prologue, but there’s always another surprise waiting to shock you in the heart. If you’ve seen the musical film The Last Five Years, you’ll recognize this storytelling technique. For those who haven’t, the conceit is that it’s one story told from the perspectives of two protagonists in inverse chronological order from each other. One protagonist, Peter, tells the story from the end to the beginning, and the other, Chel, tells it from the beginning, both for the most part in monologue form. You’ll have an impression of how it will end, and it’s the obscured other half of the story that means you’ll want to listen in exactly the order given because it’s like pulling back a curtain in slow, tense increments. Writing a narrative in this way—weaving in and out of chronological order—has the potential to go off the rails easily and lose listeners. Each episode of Janus Descending is comprehensible in its own timeline and within its placement in the opposing timeline, but additionally, each episode is somehow symbolically linked to the one before, which makes it much easier to follow. The earliest instance of this can be found in the first two full-length episodes of the series, “Entry 13” and “Entry 1”, when both Peter and Chel go off on a tangent to describe each other’s tendencies in the laboratory around each other, specifically the things that are attractive about them. It ties the episodes together at one symbolic point, for the listener to realize how in love Peter and Chel are with each other, even so deep into the horror. Knowing the ending to a horror story could also ruin the elements of tension and fear. Who among us hasn’t checked the Wikipedia article in order to watch a horror movie without losing our minds? Creator Jordan Cobb has a handle on that, too, with the help of sound designer Julia Schifini and composer Daryl Banner. In the narrative, there’s secrets for the listener to puzzle out, as there’s almost never an active conversation between Chel and Peter. That means Peter, whose story starts from the end, will elide over information that people would already be aware of and Chel’s story is one of discovery from the beginning. It’s a game of cat-and-mouse for everyone, especially when the sound design gets involved. Schifini’s first foray into the world of sound design is a rousing success. Without her understanding of silence, Janus Descending’s darkest and saddest moments would not have had the impact they did, and without her understanding of space, the mounting horror would not have echoed as it still does inside my skull. This world is built on immersive design that strikes from the shadows: minimal throughout until it must be enormously terrifying and surround the listener in the reality of a monstrous alien, its creature sounds designed by Karyn Keene, and distantly present until it must draw in close and tight to the listener to create a sense of isolation. Banner’s music composition is key to this as well; it lays the groundwork for thematic moments and creates bigger and fuller tension when leading up to an explosive scene—like “Entry 8”. “Entry 8” is a pivot point in the series, both in terms of plot and design. Up until then, Chel and Peter speak only in monologues, with a few introductory moments from the other protagonist. Chel’s story has been one of exploration, both of an alien civilization and of the possibilities of her relationship with Peter, infused with love, astonishment, and tenderness by Cobb, who voices the character. It stands in sharp contrast with Peter’s, an action-heavy horror of escaping the clutches of monsters, made gritty by the static and sounds of a ship breaking down surrounding Peter’s grim and lonely recordings. Anthony Rocco Olivieri, the voice of Peter, has imbued him with an awkward, kind veneer that conceals an ominous and darker nature; Olivieri elevates Cobb’s writing with his line delivery, purposefully stilted when in or describing social situations, but flowing easier when he’s angry and frustrated. “Entry 8” is the moment where their timelines collide, in a risky move to include lengthy, interactive dialogue, and Janus Descending’s parts all fit together like a jigsaw in this episode. 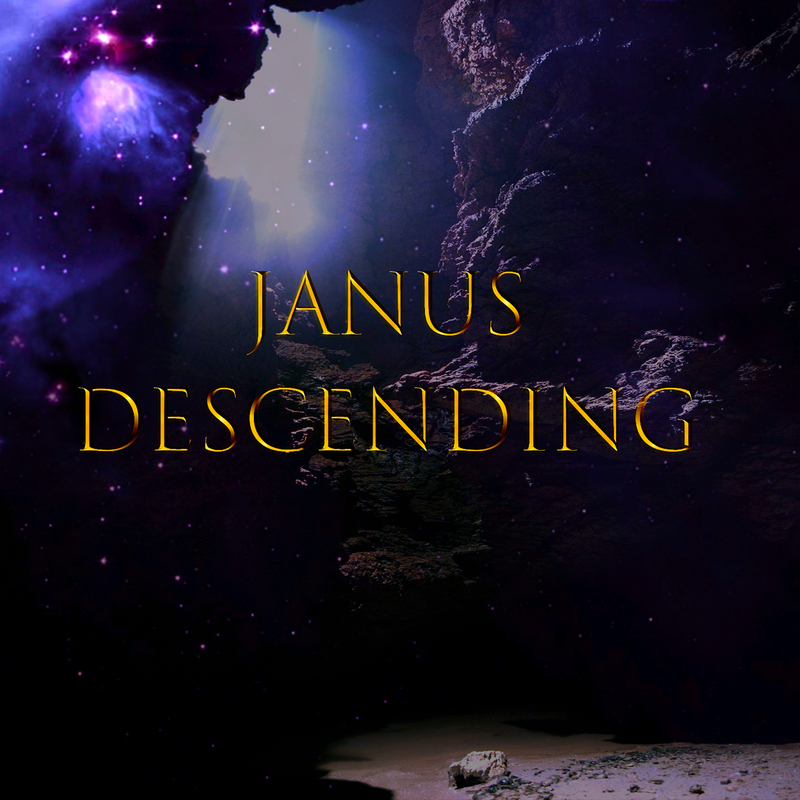 Janus Descending is a podcast that rewards re-listening to pick up the clues laid early on or the golden nuggets of engineering, in the sound design that wasn’t fully explainable but still horrifying or in the words Peter said that were strange but come across as a personality quirk. In this limited series, there is incredible beauty woven in: into Chel’s lush descriptions of ancient civilizations or of Peter’s talents, all of them so full of love; into the breathless soundscape of an alien planet, icy and haunting and inhospitable; into the compositions, one moment tinkling gently until it rumbles forward like a rock let loose from its precarious position on a cliff. Janus Descending is a work of art, with an ending that feels complete even while it promises the possibility of more. You can support Janus Descending on their production studio Patreon, No Such Thing Productions, or on Jordan Cobb’s Ko-Fi. You can also buy merch from their store and follow them on Twitter.